For you, your crew, and all that you do. When Hobnob first launched, we built a robust event invitation app that created beautiful invites in seconds and managed RSVPs, chats, and photos. Our users loved it, but they told us they still had issues with group planning and chatting when they didn’t have events. They told us they were tired of managing too many conversations on too many apps, and that they hated annoying group texts, mass emails, and all the headaches that came with them. We saw confused, frustrated, and annoyed groups that just wanted something that helped them chat, plan, and share photos privately—so we set out to build something better. What Can I do on Spaces? 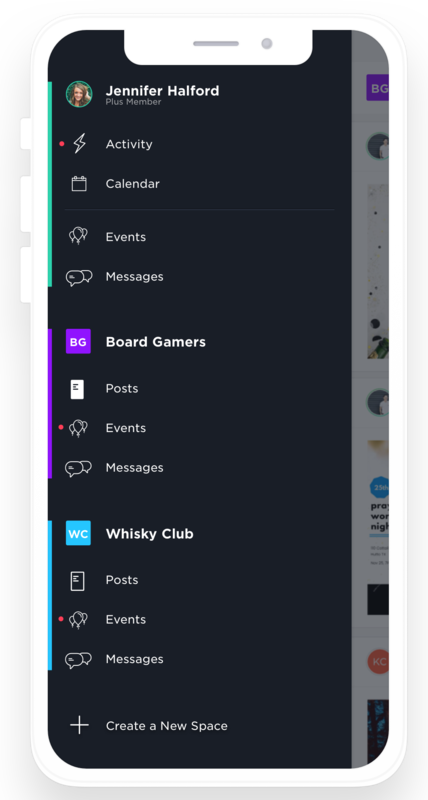 So start your own Space, give it a fun name, invite your favorite people, and leave the rest to us—Hobnob is all about slick designs and easy invitations that help make life happen. If you have questions or ideas about how we can make Spaces better, shoot us a note! Or you can tell us more about what you’re trying to do with your Space, and our Spaces experts will reach out personally and help you out! Thanks for using Hobnob and for trying Spaces, now go make yours! How do I purchase a Hobnob plan?